Each week, I issue a challenge to those who post reviews on our site. If you’d like to get the latest challenge when it goes out, please e-mail me at natdecants @ nataliemaclean.com. Use all five senses to describe a wine. We tend to lean on just two as wine writers: smell and taste. But what about colour, texture (mouth-feel, weight) and even sound as you pour the wine, or other ambient sound in your environment, such as what’s playing on your stereo to make this wine even more memorable? Evoking all five senses will make your reviews more engaging and varied. It gets you out of a rut of the same format, and makes your tasting notes different from others. Bonus idea: Right now, many people are thinking of diet and health. Which wines can make even raw carrot sticks or kale taste better? How Would an Historical Figure Talk about the Wine? Choose anyone you admire from the past, whether famous or not, and let them tell the reader about the wine. Even better, set the scene and discuss the wine with that person in a little dialogue. For example, I’d choose Dorothy Parker, one of the wits at the Algonquin Round Table in New York City in the 1920s. We’d be sharing a glass of robust Cabernet from Kenwood Vineyards and talking about how well it paired with reading Call of the Wild. I’d give her a few quotes describing the wine in her saucy voice. Alternatively, you can start with a famous quote from someone about wine (or drinking) and build on why that quote applies to the wine you’re reviewing. Or you could choose a current celebrity like Beyonce or Meryl Streep: how would they describe it? Would Beyonce put a cork in it, rather than a ring on it? Would Meryl toast her 63rd Academy Award with the wine? Adding colour and cultural references break the tedium of having every review sound the same. If you want to move beyond a long list of adjectives when you describe a wine, then explain the answer to a wine question in your review. For instance, it could be something like why are rosé champagnes more expensive than regular champagne? Although I wrote this as a blog post, I could have easily wrapped it into one of my recent reviews. Think about the questions you get asked: why this particular glass for this wine? Why does this wine work with vegetarian dishes but not with meats? Why would I serve this wine at this temperature? What happens when I decant this wine for an hour versus two hours? Why does this region produce wines with great acidity? Make your wine reviews more powerful by drawing a picture of what you think, or how you feel, about the wine. Give your readers a sense of the lengths you would go to drink the wine, how often you’d drink it, and what mischievous behaviour you might consider to get a bottle. The ultimate challenge: try writing a wine review without any adjectives at all; just nouns and verbs. This not only has more impact, but it also adds colour and humour to your writing. We have to entertain before we can educate. 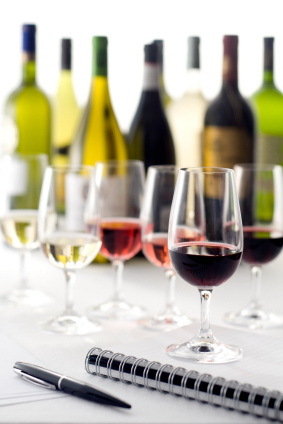 Tip: The Guild of Sommeliers offers some terrific educational wine podcasts. Listen online or download to your iPod. Social media is abuzz with Oscar talk … join in with your wine pick and use the hashtag #Oscars as well as #Wine to be part of the stream. Review a wine that you think is worthy of a gold statue, or one that’s owned by a celebrity. Vary your sentence length dramatically to catch the reader’s eye. It works. That’s just what I did above. Going long, then short with your sentences is a great way to add variety, voice and character to your reviews. 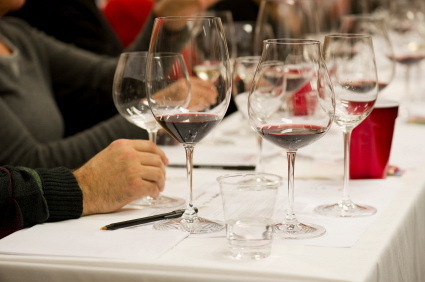 Tasting notes should follow the pattern of conversation, which has lots of variation, including sentence fragments. Try it. Bonus idea: January 19 is officially National Popcorn Day so which wine would you pair with a bowl of this warm. buttery snack? In his excellent memoir “On Writing,” novelist Stephen King advises that we disconnect from the world when writing. Close the door and focus, free from distractions. King wrote this book before the popularity of social media, but his point resonates more now than ever. When I finally turned off incoming tweets and stopped looking at e-mail every two minutes, I wrote so much better and so much more. I felt the mental “flow” that you get with sustained activity. Multi-tasting for efficiency is a myth, recently busted by several studies. Not only are we less efficient, but we are also far less effective. Give it a try. You’ll be surprised. Focus on the planet with your next wine review: March 28 at 8:30 pm is Earth Hour. Which wine pairs best with global consciousness? Turn a cliche upside down. Wine writing, like most other specialist genres, is loaded with cliches: a lovely expression of terroir, a deep core of minerality, and so on. Can you tweak one to your advantage by flipping it around? Or use a non-wine-related cliche and make it a wine one. Bonus idea: Which wine would you recommend to celebrate the Scottish poet Robert Burns on January 25, officially Robbie Burns Day. More importantly, is there any wine that pairs with haggis? Tasting tip: get more delicious with your food pairings! Sometimes, it can feel boring to say this wine pairs well with roast beef or grilled chicken. Yawn. Pair this wine with slowly grilled chicken that’s been marinated in a spicy, chipotle-infused sauce. Tip: when describing a dish within a tasting note paragraph, don’t capitalize the name of it. Only titles are capitalized. Then get some side dishes, such as corn on the cob with melting cheese and a squeeze of lime.